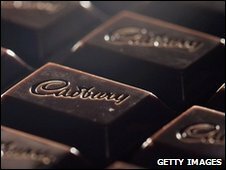 Kraft Foods will remove Cadbury shares from the London Stock Exchange after 8 March now that 75% of shareholders have agreed to the takeover. Cadbury will also apply to de-list its American Depositary Shares from the New York Stock Exchange, Kraft said. When the level of acceptances from Cadbury shareholders goes above 90%, Kraft can force the remaining shareholders to sell. On Tuesday, Cadbury accepted an £11.5bn ($18.9bn) takeover offer from Kraft. The following day, the three men at the top of Cadbury announced their resignations.